Electric, Fire Ice, FLying, Pyscic and Water are taken. Eddy and Alex will try you out. Da of The Lava Beings Iz Here! I'm limited to shoddy, but I want to be a gym leader. Could I be a shoddy only gym leader since many people here have it anyways? And if I could, I'd like to try out for the position of fighting gymleader. I'll think about it but I think not because people will have to download it to battle you but we shall see. Yeah, but so can your opponent so it's still fair really. Any even on wifi you can get any EVs you want if you want to work for them, IVs is another question, but your opponent will have perfect IVs anyway so I don't see how it matters. I wouldn't be opposed to Shoddy gym leaders personally but I could see how it might be a problem for some people. I guess it would really just depend on how many people that didn't have shoddy were effected. I suppose you could like start out on Shoddy whilst you make a team on your DS - then switch over when it's finished. Um can i be the Dark Gym leader Plz Im cut out 4 it trust me ask any1 that knows me other than CrimsonEmpoleon who thinks he is better than me but i still have a better record than him. Okay tell Kozova,Tati,Maple_Syrupp,Or Eddy to try you out. ueueueueu sounds like feshies 2 me this shall b fun. and i didnt mean like noobs ok. I know tati eddy and koz and i tink i met maple sumwhere b4. ok.
Can I test people out too Alex or Eddy? Sure. Just everytime you test someone PM me with the info and stuff to decide if they passed. Perhaps I will try out for a gym...... although why not just become the Champion of the Elitre four! 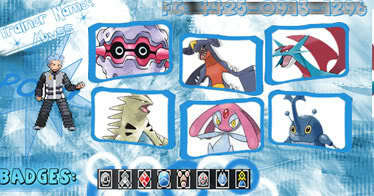 Or maybe just an Elite Four Member seeing as it'll take me some time to make a team! Anyway, see you on! Ok Kozova,Tati,Eddy or Maple will test you. Eddy,Kozova,Tati,and Maple can test you. You said I could have the ground gym when I get my team onto DS so..... is that a taken type now? Nope its open. Get your team and someone will test you on Wifi.